Small parts and components are typically stored in bins and baskets that are difficult to access. Serco LoadWarrior™ Tilters position parts and hard-to-reach objects within easy reach of workers. Tilters minimize reaching and bending over, thus reducing the risk of back injuries. 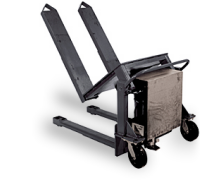 Serco LoadWarrior™ Portable Tilters combine the ergonomic features of tilters with the mobility of pallet jacks, making them ideal for loading and unloading bins and baskets at multiple work stations. Serco’s battery-operated LoadWarrior™ Portable Tilters put small parts and components within reach of workers, and improve accessibility of products while reducing the risk of back injuries. 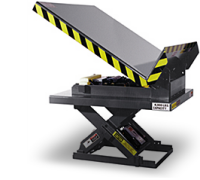 Serco LoadWarrior™ Air Tilters combine a safe and clean activation system with the ergonomic advantages of tilters. Serco LoadWarrior Air Tilters utilize an airstroke actuator and come standard with fork pockets to allow easy portability in addition to ease of installation.